It's time, it's time! Time for the second annual Chronicles of Narnia Reading Challenge. The goal? To spend the month of July reading as much about Narnia as possible. You have the whole month to read individual stories in The Chronicles of Narnia or to watch the movies, listen to audio books or read books about Narnia or C.S. Lewis. Whatever you have the time to do, I invite you to do. As you proceed through this Challenge, write up various posts about what you have read or your thoughts and impressions. On Friday, July 29th we will conclude the challenge and at that time I will invite you to share your posts with us. An introductory post in which you share your goals for the month is highly recommended and encouraged. Let the journey begin! According to Puddleglum in The Silver Chair, are giants good shots at throwing things? No. My daughter and I are in. I wrote about this challenge in my last Sunday Post. I only knew two quiz answers. Definitely a sign I need to reread the series! Oh, and thanks for hosting! I have nothing yet but might join in later if inspiration strikes... I love Narnia and wouldn't want to miss the voyage. I'm in! 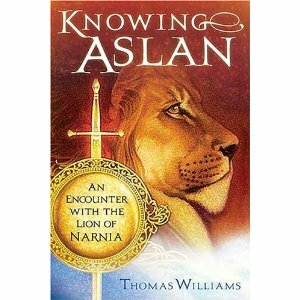 I think I'll reread the series again as well as "Aslan's Call" by Mark Eddy Smith and "A Field Guide to Narnia" by Colin Duriez (the two books that I have on hand about Narnia). Looking forward to it! I'm always up for a Narnia challenge. I think I'll re-read "The Horse and His Boy" using "Roar" as the companion. I'll also read the excerpts regarding Narnia in Richard Abane's "Harry Potter, Narnia and Lord of the Rings". Oh, yes -- I'm in (already started to be exact). How fun! I wish I could participate. I love those books! I finally had time to ask Derek the questions. He did very well...only had two wrong (though one another wrong, but fixed it when I told him so). I have yet to write up my post for participation.